Looking for an extra set of eyes? These days video surveillance systems provide so much more than just eyes. 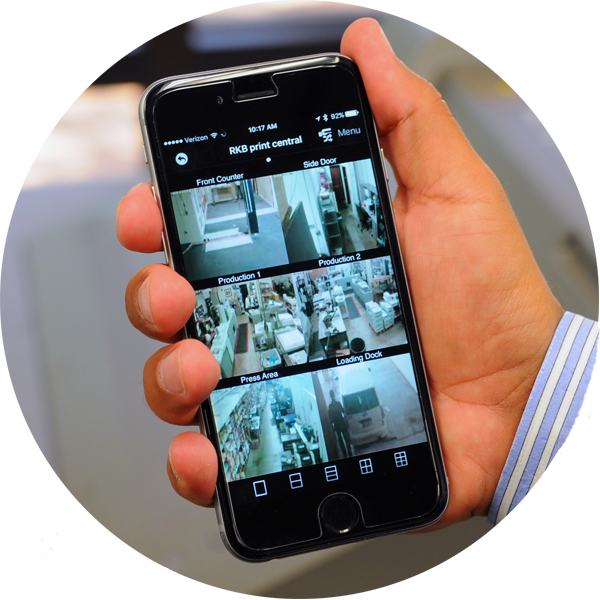 Depending on what you want, our state-of-the-art optical technology coupled with innovative software turns those eyes into a virtual security guard roaming your property. For example, if you're having a problem with dumpster-divers, equipment being "borrowed" from your premises or perhaps "artists" turning your property into their canvases, so to speak, simply tag those trouble areas for monitoring and the system will send you a text notification when it sees motion. That way, you could be in your office, your home or even on a trip and as long as you have internet access, you'll know what's happening and be able to view it remotely from your smartphone, allowing you to take action if need be. You can even set up your system to sound an alarm on premises when motion in your tagged area is detected. Perhaps your surveillance system need is more for risk management or monitoring for quality control, workplace traffic flows or employee performance — general data collection. Our systems do that too. We are your local provider and installer of competitively priced, high-quality video surveillance solutions. Whether you need an entry level, basic surveillance system or a multi-site enterprise level solution, we have a solution for you. We carry a full line of surveillance systems, state-of-the-art video management systems (VMS), utilizing high-quality cameras designed to meet your needs whether it be analog, TVI or IP cameras. You've probably heard it lots of times: "If you're going to do it right, do it right the first time." Likewise, if you want a security camera system that works, you need to have the right cameras, in the right place, powered by the right software and installed by the right people. That's why we have a state-licensed, manufacturer-certified surveillance team with a combined 24 years of industry experience to talk with you, listen to your need, scope your space, produce a solution, install it and support it. Start to finish, trust us with your needs and we'll manage the project. From our first meeting through equipment end-of-life, we are your trusted partner. If your eyes blink, ours do not. We'll get you back online. To learn more about our video surveillance options available to you, call (405) 943-9800. We are an Oklahoma State Licensed Alarm & Locksmith Company (Company License No. 1978).